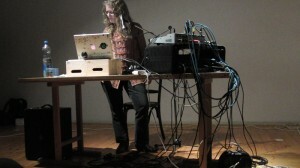 In solo performance, Dafna Naphtali uses her laptop-based noise/audio processing “instrument” to alter the sound of her multi-octave singing, vocalisms, personalized recordings. At times a curious accompaniment to her voice, she considers all sounds fair game for her unique electronic mutations and expression. Mechanique(s) solo is a collection of open form compositions using algorithmic mutations, Morse code, polyrhythmic and audio-based triggering, and gestural controllers, all set on a crazed collision course of the acoustic and the electronic –along the route paying homage (in a twirl of the radio dial) to music concrete, free jazz and European improvised music, as well as the contemporary classical and all manner of non-Western musics. In performance, she filters, samples and algorithmically mutates her voice and audio samples. She plays the resultant sounds as an instrument of her own invention, a sometimes curious accompaniment to her voice on a crazed collision course of the acoustic and the electronic –along the route paying homage (in a twirl of the radio dial) to music concrete, free jazz and European improvised music, as well as the contemporary classical and all manner of non-Western musics.